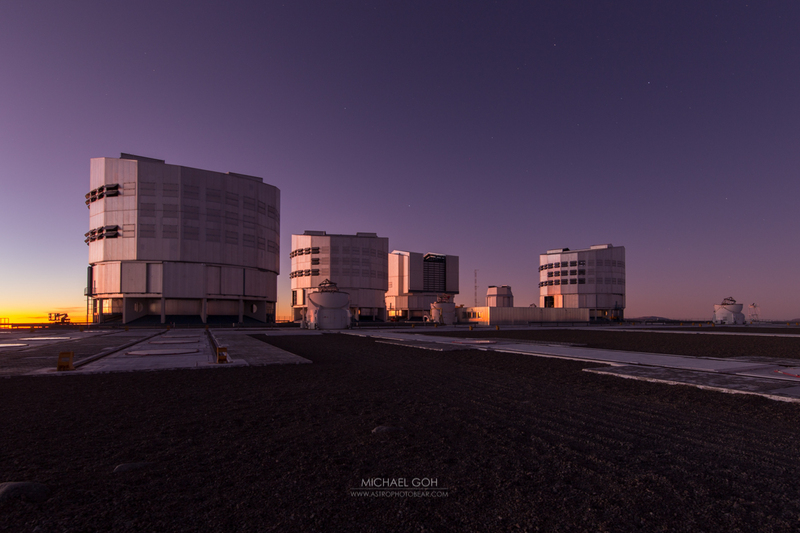 Last year, I received a great honour with winning the Nightscape category of the Photo Nightscape Awards – the prize being a trip to ESO’s VLT in Chile. I managed to organise the time at the beginning of July to go between work and personal commitments (I plan very far ahead) and also what I considered to be reasonable shooting time for both a rising and setting milky way to maximise the opportunities. 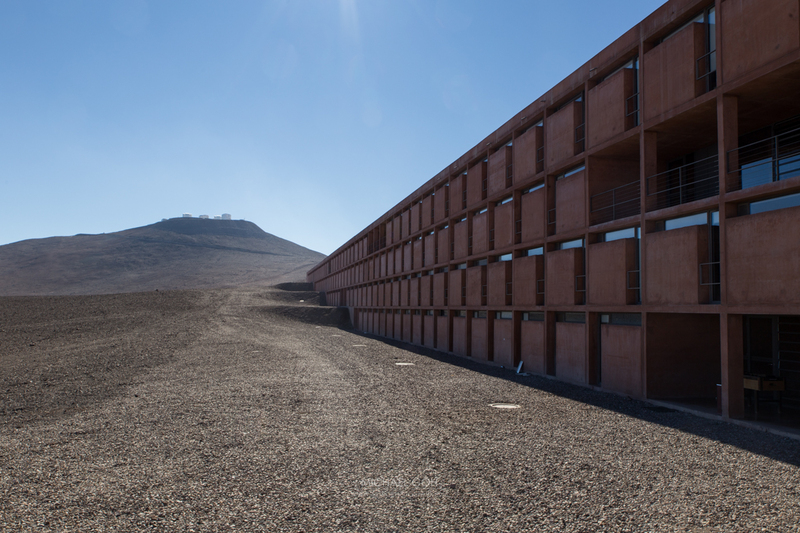 After a couple of very long flights to Santiago, I was driven by taxi to the ESO guest house in Santiago to spend the night before going on another flight to Antofagasta and then by bus to Cerro Paranal and the VLT. I met my excellent guide Mattias at the airport going to Antofagasta. Cerro Paranal is situated around 130km south of Antofagasta and about 1200km north of Santiago. The South Pacific Ocean is readily viewable from the VLT platform. The residence at was very modern. It felt very much like a university with the sense of importance (and keeping quiet). They also filmed part of the James Bond film – Quantum of Solace there. The VLT has 4 large optical telescopes and 4 smaller auxillary telescopes – and can be operated independently or collaboratively. A separate telescope VISTA is nearby (same location – different platform) and you can see the site for the proposed ELT. I can only imagine what they would call any larger optical telescope. In addition to waiting for clear skies, they have to deal with the temperature (if it’s too cold, they can’t use the telescopes) and wind. The astronomers take great care in preparation, to ensure that the precious little time that is available is optimally used. According to wikipedia – it’s >340 clear nights per year, but with the onset of El Nino – the weather has been rather mixed. Even landing at Santiago and driving from Antofagasta – the cloud looked very problematic. But coming up to night – it cleared up for the 2 nights that I was there. Imaging at the site is challenge. I’m used to shooting by myself and at least using red lights to work out precise changes in angles etc. For the time I spent there, I used a large amount of gaffa tape to cover any lights on the camera and made guesses on the angle changes. I used a hoodman loupe to assist with reducing the light from the back screen of the camera. The gravel on the platform is dark in colour, so even with some of the extreme exposures was still very dark. Naturally because of the sensitivity of the site – I couldn’t do any of my normal selfies ;). I had to be very careful where I walked (avoiding vibrations at various areas on the platform) and even more careful with light if the telescopes were pointed in my general direction. Since the telescopes are on a platform, you have physical limitations of where you can go for the compositions. I had contemplated a few off platform images, but the time that would have been taken hiking back would have limited any other imaging. I was very much in awe at the work that they do there and endeavoured to be as careful as possible when imaging. The first night – I imaged a couple of rising milkyway panoramas and returned later to do a setting milkyway. The airglow was very prominent on first night with some strong red and green when imaging the setting milkyway. The temperature was quite cold and too cold for the telescopes to operate (affects the oil). After the first night though, I felt very under the weather. Possibly the long flights and cold night. The weather was not so cold for the second night and was interesting watching the telescopes rotating as they surveyed the skies. Would have been great to bring more than one camera body with me on the trip for some time lapses – but I was pushing the weight limitations as it was. I thought I would use the 70-200 on the trip – I did a little, but not really enough to warrant bringing it on the trip. The skywatcher was great for the trip although a bit heavy.